Biggest Fish Ever Caught on Watta Bite – 29 lb King! Congrats to Larry and Tom on the biggest fish ever caught on Watta Bite. 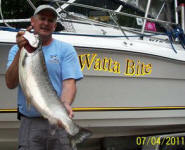 Tom landed a MONSTER 29lb King and Larry landed a 25lb King — Watta battle it was! Lots of fun and great trip!